In the mid-1800s, a chance encounter between a brand-new city in the American wilderness and an ancient people fleeing persecution in Europe would change the course of history for both. San Francisco and the Jews who found a home there embraced one another, reshaping the destinies of each. American Jerusalem: Jews and the Making of San Francisco is the epic story of the pioneering Jews of San Francisco, their rise to prominence, and how, freed from discrimination, they reinvented themselves as a distinctly new kind of Jew: they weren't just American Jews—they were San Francisco Jews. In 1848 San Francisco was a remote seaside village, with little more than 500 non-Indians living there. Then James Marshall discovered gold on the American River, 120 miles east. Tens of thousands of prospectors flooded into California from around the country and the world. Thousands of Jews were among the newcomers, some born in the United States, but many more immigrants who had fled persecution in Central Europe. Like everyone else making the difficult journey to California, Jews sought riches—but they also hungered for something more: the opportunity to shape a new life for their families and their people. In San Francisco they found their Promised Land. In the middle of the 19th century, San Francisco’s infrastructure and institutions were not yet built. Therefore, and in stark contrast to cities elsewhere in America, where Jews had to fit into an existing power structure, many Jewish pioneers built those institutions, becoming prominent merchants, politicians, and civic leaders. By 1870 the city was a thriving metropolis of 150,000, of which more than 10% were Jews—the largest Jewish population outside of New York City. By day Jewish and non-Jewish businessmen cut backroom deals; by night they would occasionally socialize with one another. How did the most successful of these rural Jews from Germany transform themselves almost overnight from poor peddlers to merchant princes? American Jerusalem traces these pioneers' remarkable journey from Germany to the Gold Rush and up to the 1915 Panama Pacific International Exposition, an epic world's fair held after the city had rebounded from the 1906 earthquake. During the Gold Rush, San Francisco accepted Jews as just another part of white society, and as a result Jews integrated into and had a greater impact on the building and defining of this city than anywhere else in America, or the world. For the first time in American Jewish history, the ultimate outsiders, the Jews, became insiders. American Jerusalem begins in Germany, in the Nuremberg State Archives, which houses documents that severely restricted the Jews, and in the countryside of Bavaria, where 150 years ago the Jews were impoverished, second-class citizens denied basic rights. It follows them through the jungles of Panama by boat and on foot, to their arrival in Gold Rush San Francisco. 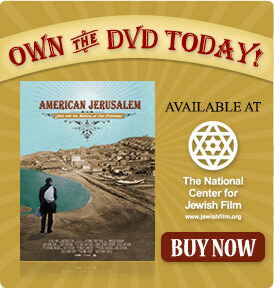 Using archival photos, re-creations, and animation, American Jerusalem traces how when given the opportunity, these pioneering Jews built upon their skills as peddlers, one of the few occupations open to them in their native Germany and one that was poorly valued, to become powerful merchants in San Francisco as well as civic leaders and philanthropists. Acceptance and success, however, challenged Jewish cultural norms and identity. Newly liberated, most Jewish pioneers shed their traditional ways, adapting their Jewish identity to life in a world of unmatched opportunity. They continued to see themselves as Jews, starting Jewish mutual aid societies, creating Jewish cemeteries, publishing Jewish newspapers, and founding Temples--when it opened in 1866, Temple Emanu-El's new synagogue dominated the San Francisco skyline. At the same time, more Jews in San Francisco ceased religious practice than elsewhere in the nation and the city's largest temples embraced what was then a radical new form of worship called "reform Judaism" which borrowed heavily from Christian practices. San Francisco's pioneering Jews were searching for a balance between maintaining their age-old ethnic identity and becoming something new - an American - a process experienced by all who immigrate to America. As Jews found themselves on the right side of San Francisco's power divide--one that favored whites over people of color--they were confronted with new and difficult moral choices. The largest racial minority on the West Coast were the Chinese. They were exploited as cheap labor, oppressed by legal discrimination, and openly despised by white society. Jews employed Chinese workers in their businesses and, like other whites, expressed deeply bigoted views towards them. In the late 1870s white working class frustration erupted into anti-Chinese riots. While there is no evidence that Jews participated in the rioting, neither is there evidence that they condemned the violence. Decades later, in concert with other white California politicians one prominent Jewish congressman from San Francisco--himself an immigrant from Germany-- introduced the Chinese Exclusion Act of 1902, to that point the country's most racist immigration law. American Jerusalem is also a film about the rise of San Francisco—it tells the story of how the city and its Jewish community grew together. The film begins during the Gold Rush and culminates in the devastating 1906 earthquake and the city’s revival on the world’s stage, at the 1915 World’s Fair. The Jews of San Francisco thrived because San Francisco was a unique place—diverse, accepting, and open to innovation and change. The legacy of this rich history lives on today. The San Francisco Bay Area Jewish community remains different from other Jewish communities in the United States--more diverse, secular, and open, with a lower rate of synagogue attendance and a higher rate of intermarriage. American Jerusalem unveils the long and largely unknown history of this singular community, as well as its significance and place in the fabric of not only California and the West, but of America.